Today, the voters of the United States of America go to the polls to chose who will be the President of their country for the next four years. 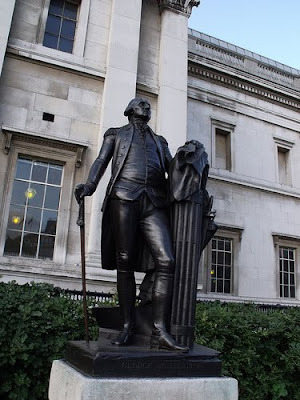 There are many statues of Presidents in London one of the first President, George Washington, stands on the lawn in front of the National Gallery. The statue was installed in 1921, having been given by the US state of Virginia, and is a bronze copy of a marble statue by Jean-Antoine Houdon which stands in the rotunda of in Richmond, the capital of Virginia.